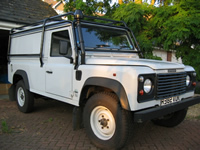 The Weasel - without roof tent, side windows, bull bars, spots, side lockers. In fact as it arrived apart from the roll cage. This site is going to detail our 6 month journey around South America. Hopefully we will be updating on a fairly regular basis from Internet Cafes as we go. Having spent 3 weeks in Peru a couple of years ago we have always wanted to go back and explore a little more. This time we don't want to be at the mercy of a tour itinerary. There is no way we could have seen as much as we did in those three weeks without going with an organised party but sometimes the experience is not quite the same as doing it under your own steam. So the seed was planted. Like all good plans nothing was done until it was very late. Luckily we were both able to get unpaid leave for six months. The only problem was we had to start in August 2003. It was March already and we had no Land Rover, no itinerary, no plan, no route and no idea. Follow the diary to see how we get on.